If you don’t like chocolate you should stop reading this now. Chocolate is a food of the gods, literally. 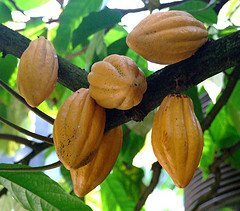 The 18th century Swedish scientist Carl Linnaeus thought cacao was so important he gave the tree the name Theobroma cacao, or “Cacao, the food of the gods”. 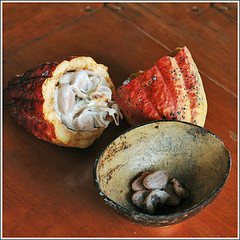 If you’re not familiar with the word cacao (pronounced “ka-kow”), it’s what all chocolate is made from and is actually a bean (also known as cocoa bean). Cacao beans grow in a fruit pod that hang from the trunk of the cacao tree as seen in the picture above. Most people equate chocolate with candy and sugar, and lump it with foods to be avoided or only eaten on special occasions. While most processed or adulterated chocolate should be considered as such, cacao in its raw form is one of the top superfoods in the world. Antioxidants: Cacao packs a tremendous antioxidant punch, with more antioxidants per weight than blueberries, acai, pomegranates, goji berries, and red wine. Feel Good: Cacao is rich in the amino acid tryptophan, which is used by the body to produce the neurotransmitter serotonin, nature’s feel good chemical. Brain Health: Nutrients in chocolate have been implicated in enhancing cognitive performance. Magnesium: Cacao is the the top whole food source of magnesium. Could lack of magnesium be why so many women crave chocolate? Magnesium is an underrated mineral that promotes good health in a number of ways. Vitamin C: Extremely rich in this all important vitamin. Heart Health: Numerous studies have shown cacao to be beneficial to cardiovascular health. Good Teeth: Chocolate and the health of your teeth have long been associated. Here’s the best news ever: you can eat chocolate and not feel guilty! Cacao blends well with most smoothie ingredients, but in my opinion goes best with chocolate protein powders, bananas, berries of all kinds, coconut products, avocados, vanilla, and bee products. It should be noted that cacao on its own is rather bitter; so be sure to include a sweet fruit, protein powder or sweetener to bring out the rich chocolaty taste in your smoothie. I prefer cacao powder for my smoothies, but nibs will work too, and make a great addition to homemade trail mixes. Place all the ingredients into your high-speed blender and blend for around 30-45 seconds or until nice and smooth. Please leave a comment below if you try this chocolate superfood smoothie. Happy Blending! This sounds INCREDIBLE! I can’t wait to make it! Thanks for providing such a great one-stop shop for smoothies! Hey Trisha, I’m pretty confident you’ll love this smoothie :) Cheers! Hey Ryan, excellent article man. You know what’s remarkable, this is exactly how I make my cacao smoothies at home. There is really only a few ingredients that blend well with cacao due to it being some unpalatable by itself. Hopefully more people find your article and enjoy the benefits of this amazing super food. Keep ’em coming. I guess great/healthy minds think alike ;) Lately, I’ve been pairing cacao with avocado, coconut oil, maca, dried mint, and honey. Divine! Getting more people to consume superfoods including cacao is my goal. Sounds like you’re superfood smoothie veteran :) Glad you’re enjoying my recipes. Love this recipe! I added organic spring greens and stony field organic vanilla yogurt. It was great! Organic spring greens and vanilla yogurt, excellent additions, Nicole! I made my smoothie with 1 cup Almond milk 1 frozen banana 1 handful frozen strawberries 1 TBSP Raw Honey 2 TBSP Cocao powder in my Ninja and it was kinda thick, so I added a splash more Almond milk to it. Love it! I can’t wait until Strawberry season! Thanks for sharing, Laurie! Your version sounds extra chocolatey and delicious. I was just commenting on another recipe that mint is an underrated smoothie ingredient. One that I love and use often. Great recipe! Used fresh banana, raspberries, cacao, and soy milk. Added chia seeds too. Whizzed it all in nutra bullet. Great taste and consistency. Great to hear you enjoyed one of my favorite recipes, Kathryn! Needed to satisfy a sweet chocolate craving and ended up on this page and I’m glad i did. Just perfect, thank you! This smoothie is amazing…especially with chocolate protein powder. .put it in my blender and it’s thick, creamy and filling. Definitely rate this !!! Great smoothie. I am87 years old love all your recipes. Thank you!